Protected area managers and stakeholders in Vanuatu have completed training in open-source Geographic Information System software. The spatial analytical programme allows users to create, view, store and analyze data in real-world. During the training participants learnt how to import, style, label and manage data, create their own protected area data and create professional maps. In addition, they also received hands-on training on how to map real-world areas and objects with handheld Global Positioning System (GPS) devices. 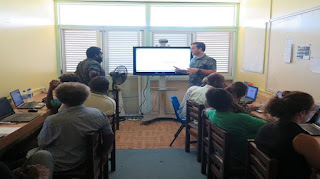 "It was an excellent capacity building exercise where participants both learnt how to new GIS software and, in the same exercise, map Vanuatu Protected Areas that previously weren't mapped before" Said Mr. Ryan Wright, Spatial Planning Officer at SPREP. The GIS training was co-organised and implemented by the Secretariat of the Pacific Regional Environment Programme (SPREP) and the Vanuatu Department of Environmental Protection and Conservation (DEPC). "The training is part of SPREPs ongoing support to its member countries through its Pacific Island Protected Area Programme. This training signifies a positive step forward towards a comprehensive and up-to-date national protected area dataset which will help Vanuatu to achieve global, regional and national targets and priorities for protected areas," said Mr Vainuupo Jungblut of SPREP. Therefore, this training is a great learning opportunity for us at the DEPC as well as for the stakeholders,”said Ms. Rolenas Baereleo, Senior Conservation Officer, Vanuatu DEPC. Participants at the training gave positive response and were thankful for the training. "I found the training very relevant to my work. Normally we would hand draw maps of areas with the help of communities that we work with, however, through this training I was able to produce maps that were more accurate a lot easier and faster. I would like to thank SPREP and Vanuatu DEPC for this very useful training," said Ms. Jessie Kampai of Vanuatu Live and Learn. "The training will help the conservation managers and government departments to help communities to accurately identify and map boundaries of their current and proposed conservation areas. I particularly liked the field exercise involving the use of the GPS devices," said Mr. Taman Onesmas, provincial government representative for Shefa Province. Photo: SPREP SPREP Spatial Planning Officer, Ryan Wright (right), during discussions with the training participants.